There are just so many new things and large boxes coming into Urban Yarns every day now! It must be fall too because I am totally looking to knit up a scarf in something new. What we haven’t got new, we’ve got new colours. If you want to knit pretty much anything come on down and we can hook you up with something you might not have worked with before. A couple of our new yarns are well matched to one of my favorite designers, Jared Flood of Brooklyn Tweed designs. 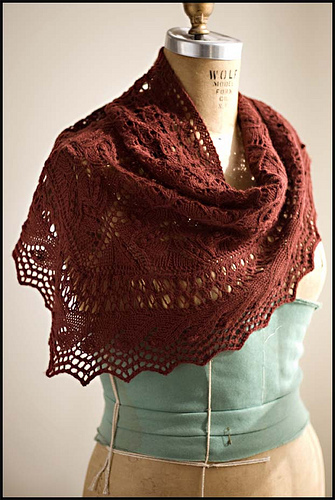 The first is a return to the lace obsessoin: Juneberry Triangle. It’s knit up in the new St Denis Nordique yarns and we’ve got the pattern in the fantastic new St Denis Nordique books. 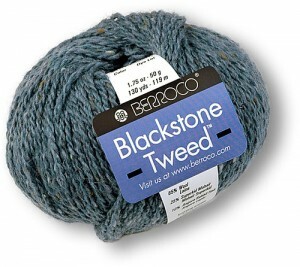 The other pattern/yarn combination I am most excited about is the new Blackstone Tweed from Berocco. This yarn is delicious, it combines the beauty and rusticness of tweed with a super soft combination of wool, mohair, and angora. It’s so yummy. The pattern I am definitely knitting with it is Dryad, from Jared again. 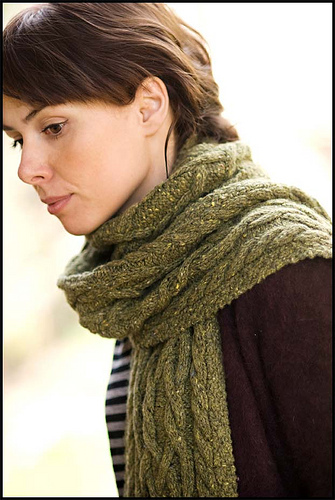 It’s a cabley scarf with tons of intricate twists and turns. I picture it at home on the moors of Scotland, bit of an imagination. We’ve got some really beautiful colours in both of these yarns. I’m having a hard time deciding which colour to whip up the Dryad in. This combo will definitely quench my scarf knitting thirst! This entry was posted on Monday, September 13th, 2010 at 10:53 am	and is filed under Uncategorized. You can follow any responses to this entry through the RSS 2.0 feed. Both comments and pings are currently closed.